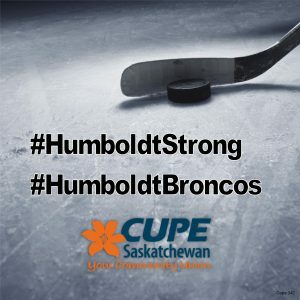 On behalf of 30,000 CUPE members across Saskatchewan, we mourn in solidarity with the victims and families touched by the Humboldt Broncos Jr ‘A’ Hockey Club bus tragedy resulting from a collision over the weekend on Friday, April 6, 2018 at the intersection of Highway 35 and Highway 335 approximately 30 kilometers north of Tisdale as the team was travelling by bus headed to Nipawin. Of the 29 people aboard, 15 lives have been lost and many others remain in hospital with serious injuries. We will always remember the young lives of the Humboldt Broncos that have been lost too soon and the lives of the bus driver, coaches, athletic therapist, statistician and radio announcer. We know there is comfort and strength in the power of community as we all join together to share in the grief of this tragedy, offer out heartfelt condolences to the families who have lost a loved one and extend our support to those being cared for in hospital forever hopeful that they will recover. CUPE Saskatchewan extends our gratitude to the each and every first responder, health care worker and support worker for being there for the victims, local officials and community members involved in the response along with their families and communities.